Celebrate Earth Day in the Windsor-Essex Community! There are many exciting Earth Day events happening in Windsor-Essex this year! Read about them below and contact the organizers for more information. ACT Recycling Day – Celebrating 10 Years! Devonshire Mall’s yearly recycling program is celebrating 10 Years on Saturday April 21 2018, from 9am to 5pm! Here’s your opportunity to start some spring cleaning. Simply visit our drive-thru drop-off located in the Devonshire Mall south-east parking lot near Cineplex. You can recycle your electronics, household items, clothing, bicycles, old medication and more. Then, come inside to learn more about local environmental programs and organizations! The Detroit River Canadian Cleanup will have a booth in front of Purdy’s Chocolatier! For more information please visit Devonshire Mall’s events page here. Each year, millions of tons of plastic is dumped into our waterways, taking hundreds of years to break down. As Earth Day 2018 approaches we’re asking students to tell us how they will make a difference and reduce their plastic consumption. Whether it’s spreading the word on social media, creating a poster to hang in your school, or showing us ways you you would recycle more plastic – we want to know about it! Students can submit illustrations, essays, poems or photos. Students must currently be enrolled in school or be home-schooled in the Windsor-Essex Region. *Submissions should not be copyright; by making your submission you are granting ERCA the right to use it on its website or as part of other ERCA publicity. 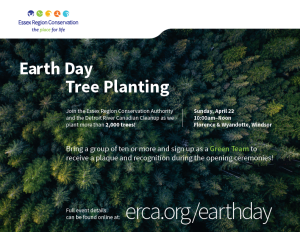 April is Earth Month, and the DRCC and the Essex Region Conservation Authority is inviting everyone to join us on Sunday, April 23, 2017 from 10am – Noon to help plant more than 2,000 native trees and shrubs in the City of Windsor. While we have shovels to share, you may wish to consider bringing your own to this free event! Event happens at Florence & Wyandotte in Windsor. Parking will be available at the Sand Point Beach Parking Lot off Riverside Drive. Register your Green Team using the form here! Teams of 10 or more receive special recognition! Click on the poster to download a PDF copy. To see a map of the event location and parking spots, please view the online map here. Join the City of Windsor to celebrate Earth Day 2017 on Sunday, April 22 from 10:00 a.m. until 3:00 p.m. at Malden Park (4200 Malden road). This event is free for the public. There will be over 40 environmental exhibits; wildflower planting; arts and crafts; a nature scavenger hunt; and many more environmental activities! Earth Day is a day on which events are held worldwide to increase awareness and appreciation of the earth’s natural environment. Our organization aims to educate residents on environment and sustainability issues using hands-on, interactive methods. Over 45 different organizations participate in this event, designed to provide a voice and venue to environmental causes. Earth Day Windsor Essex has been celebrated since 1989.